← How is Your Customer Service? On Wednesday, we had one of our breakfast meetings with a presentation on the changes and pending legislation for Ohio’s worker compensation laws. It made me think of the accidents and injuries we’ve heard about from some workplaces and what they did to reduce them. One of the key responsibilities of managers is to make sure the organization is operating effectively and that includes making the right decisions to create a safe workplace. What kind of decisions do you make at your workplace to reduce accidents and injuries especially if they’re recurring? Do you counsel employees? Put up signs? Maybe use disciplinary measures? Do you create new policies or procedures? A lot of workplaces do any of these or a combination of them but are these the best decisions we can make? Some may or may not work but the best way to reduce accidents and injuries, particularly the recurring kind such as back injuries and slips and falls, is to take some of that great data we possess and use it with some problem solving tools and techniques to identify the underlying causes of what’s going on. The first tool that could be used may save time as it can narrow down the specifics of accidents and injuries. This tool is a Pareto chart. It can be used to chart and identify the type, number or frequency of accidents and injuries. It also may be useful to narrow down a particular day, shift or specific time of occurrence. It also can help us determine which departments may have more problems. There are many things this can help us to identify but it really provides a good starting point to determine where, when and possibly how accidents and injuries are occurring. 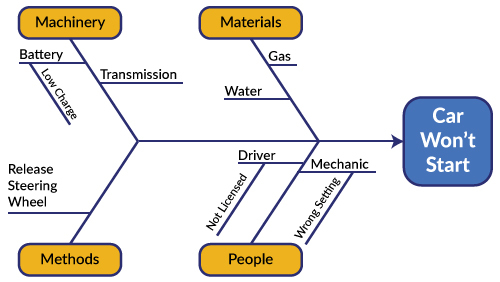 Another useful tool is a cause-and-effect diagram or sometimes called a fishbone diagram. This can help determine “why” or the cause of the accident or injury. It’s a very simple process because it’s a matter of asking “why” something happened. With a fishbone diagram, it helps to use the four main categories, or bones: manpower, methods, equipment and materials. The example above shows a very easy problem about a car not starting. We can see many different causes as to “why” the problem is happening. Each time “why” is asked in one of the four categories, another bone is added which shows the causes for the accidents or injuries but usually when the fifth “why” is asked, the root cause is usually identified. Going back to safety issues, under manpower we might ask “why” and the response could be improper training. We then might ask “why” for improper training. It might be the wrong person trained workers or no training. Under methods, maybe it’s a certain procedure of what’s being done. Machinery might identify a problem with equipment that’s causing an injury. All of these help us to determine some causes which is important because it gives us more information on why the problems occur and apply more appropriate solutions. You may decide to use both a Pareto chart and a fishbone. If you use a Pareto chart first, we might be able to identify a specific day or shift. We could then use the fishbone to determine the “why” it happens on the day or shift. Maybe the crew on the specific day or shift uses a different procedure than other crews or maybe it’s a training issue. Both will save us some time and give us better information to resolve the issue. And a third problem solving tool that is especially good with labor-management groups is the Interest-based process. We can use both of the above tools in conjunction with interest-based. Pareto charting and fishboning can be used to help steps 1, problem identification, or even in steps 3 and 4, identifying and selecting solutions. Not only does the interest-based process help to identify the problems and solutions, it also helps with the support and buy-in of any decision, such as new processes or policies, that may be needed to improve safety in the workplace. The 2nd step, identifying interests, helps groups realize they have more in common than they thought which really helps to develop solutions that both sides can support. An even better tool is to put a safety committee together that is representative of the organization with workers and management people who are committed to making the workplace safe. They can use all the problem solving tools and techniques described above once they are trained and have an ability to use them. A facilitator who also is trained in the problem solving tools can help them especially as they start out and issues arise. In addition, if you bring everybody together or invest in a safety committee, you’re making employees more aware of the workplace safety issues plus it demonstrates the commitment managers have to keeping the workplace safe which everybody appreciates. We’ve blogged before about Skinner Diesel in Columbus and how the owner overcame the huge number of accidents that were occurring. He invested in a safety committee that has brought the workplace down to “0” accidents for multiple years because the committee took the time to explore potential problems and find solutions that worked for everyone. When an accident did occur, they reviewed it and came up with solutions when necessary to prevent it from happening again. As managers, we become frustrated and complain about workers who rush through their work without doing a good job. The same thing can happen when managers rush to resolve an issue, especially when safety is involved. When we rush in our job to make a decision without having all the facts, we’re not any better than the employees we complain about. We may make a knee jerk reaction to take care of the problem quickly but it doesn’t mean we’ve solved the problem or are effective at it. Just as we want workers to slow down and do their jobs better, we need to do the same with the problem solving we are responsible for. There may be times when we have to make quick decisions but when we do, we should go back and review the decision. Sure problem solving techniques like those above can take more time compared to the knee-jerk reaction but the outcome is so much better. As we tell groups, think about the amount of time it takes to do something over and the time wasted because the problem wasn’t fixed right the first time. By gathering some good information and truly exploring what’s going on and why it’s happening, it gives us a much better chance of solving the problem the first time. So let’s set a good example to employees and take our time at doing our job of solving workplace safety issues. You may save some fingers, toes, and a life by doing so!